You can send flowers to Russia and other FSU countries from our online flower shop easily. Our company offers fast and relaiable service. We are proud receiving good references from our customers. Your order is very important for us and it will be handled with high professional care and attention. Excellent customer service has always been our top priority. Contact us and you will love the way we take care of you. Our company provides flower delivery to Russia from any place worldwide doesn't matter what city or town you choose and we guarantee to deliver flowers to Russia on the date you tell us. If you need to send flowers to Russia, just select some design among our Russian flowers – take a look at our pages with picturesque and vivid photos of the bouquets. When we started to create the list of bouquets and flower arrangements for you to choose from, we wanted it to have designs in different styles, so every visitor of our Internet flower shop can find something nice for himself. Just take a look at our catalogue and choose flowers in Russia that we have. If you or a recipient of the gift like something unusual, look at our “Roses for the Dessert” arrangement or a “Painting of Flowers” bouquet. A “Non-Writing Set” is, for sure, an amusing one. If you like exotic flowers, you can stop your choice at “Charm of Luxury” or “Tropical Arrangement”. If you prefer classical designs with traditional flowers then we have for you a great variety of bouquets made with roses, lilies, carnations, gerberas. And of course we provide a great choice of tender romantic arrangements which are perfect as gifts on different holidays. We deliver not only flowers themselves. You can add a soft toy, chocolate candies, a sweet cake, a bottle of champagne, fresh fragrant fruits to the bouquet that you are going to send. Another original variant is to add coloured air balloons – a perfect gift, especially for one's birthday. You can choose something for yourself too – tick “Free Photo Delivery” field and we'll send you a photo of a recipient with your flowers made at the moment of delivery. 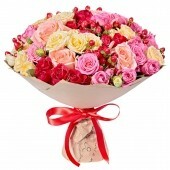 We also offer variants where you don't need to add anything and still be able to send not only flowers. For example, “Vitamin Cocktail” is a perfect combination of flowers and fruits, same as “Gift Basket for Him” and others. And an arrangement “I Love You” consists of a bouquet of red roses and a cute soft Teddy Bear. We arranged our bouquets into different groups, so it's very easy to choose flowers to Russia on our website. Look through the categories on the left where you can find division by price, by type and by occasion. 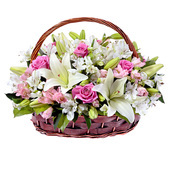 It's really easy to send flowers to Russia with our on line flower shop. We'll be glad to help you with flower delivery to Russia – let's make people happy together! Cities in Russia we provide delivery of flowers to: Moscow, St. Petersburg, Novosibirsk, Ekaterinburg, Nizhny Novgorod, Omsk, Samara, Kazan, Rostov-on-Don, Chelyabinsk, Perm, Ufa, Volgograd, Voronezh, Krasnoyarsk, Krasnodar, Saratov... currently we deliver flowers to 893 cities in Russia. See Full list of the cities serviced or Search by alphabet A-E F-K L-S T-Z. Cities in Ukraine we provide delivery of flowers to: Kiev (Kyiv), Odessa, Kharkov, Dnepropetrovsk, Donetsk, Mariupol, Lugansk, Nikolaev, Kherson, Krivoy Rog... currently we deliver flowers to 257 cities in Ukraine. See Full list of the cities serviced or Search by alphabet A-E F-K L-S T-Z. Cities in Belarus we provide delivery of flowers to: Minsk, Gomel, Mogilev, Brest, Grodno, Vitebsk... currently we deliver flowers to 52 cities in Belarus. See Full list of the cities serviced or Search by alphabet A-E F-K L-S T-Z. Cities in Latvia we provide delivery of flowers to: Riga, Daugavpils, Jekabpils, Jelgava, Jurmala, Liepaja, Ventspils... currently we deliver flowers to 23 cities in Latvia. See Full list of the cities serviced or Search by alphabet A-E F-K L-S T-Z. Cities in Lithuania we provide delivery of flowers to: Vilnius, Klaipeda, Siauliai, Kaunas, Visaginas, Silute, Mazeikiai... At present delivery to anywhere in Lithuania is available. See Full list of the cities serviced or Search by alphabet A-E F-K L-S T-Z. Cities in Estonia we provide delivery of flowers to: Tallinn, Tartu, Narva, Parnu, Otepaa, Kohtla-Jarve, Kuressaare... At present delivery to anywhere in Estonia is available. See Full list of the cities serviced or Search by alphabet A-E F-K L-S T-Z. Cities in Moldova we provide delivery of flowers to: Chisinau, Tiraspol, Benderi... currently we deliver flowers to 38 cities in Moldova. See Full list of the cities serviced or Search by alphabet A-E F-K L-S T-Z. Cities in Kazakhstan we provide delivery of flowers to: Almaty, Astana, Karaganda, Taraz, Petropavlovsk, Uralsk, Aktau... currently we deliver flowers to 50 cities in Kazakhstan. See Full list of the cities serviced or Search by alphabet A-E F-K L-S T-Z. Cities in Armenia we provide delivery of flowers to: Erevan, Gyumri, Vanadzor... currently we deliver flowers to 99 cities in Armenia. See Full list of the cities serviced or Search by alphabet A-E F-K L-S T-Z. Cities in Uzbekistan we provide delivery of flowers to: Tashkent, Samarkand, Namangan, Djizak... currently we deliver flowers to 14 cities in Uzbekistan. See Full list of the cities serviced or Search by alphabet A-E F-K L-S T-Z.